The Lighthouse Wimore was seized and its crew members questioned by the South Korean authorities when it revisited Yeosu on Nov. 24. It remains in South Korean custody, officials said on Friday. United Nations sanctions resolutions require nations to inspect and impound any vessel in their ports that was suspected of illegally transporting goods to North Korea. Word of the seizure emerged after Mr. Trump used a tweet and an interview to accuse China of letting oil flow into North Korea in defiance of United Nations sanctions, warning that there will be no “friendly solution” until this stops. A petrol station in Pyongyang, North Korea, in July. Washington has called on the United Nations to blacklist 10 ships for circumventing sanctions intended to limit fuel shipments to North Korea. Mr. Trump’s accusation came amid deepening suspicions in Washington and among its allies that Chinese oil tankers were secretly transferring petroleum to North Korean ships on the high seas despite United Nations sanctions that prohibit such trade. China insists that there was no sanctions violation. The United Nations Security Council has ramped up its efforts to squeeze North Korea’s oil supplies after the country conducted its sixth nuclear test on Sept. 3 and followed it with the launching of an intercontinental ballistic missile, or ICBM, on Nov. 29. The United Nations sanctions resolutions call for capping annual exports of refined petroleum to North Korea at a half-million barrels, an 89 percent cut from previous annual shipments. They also call for freezing crude oil shipments at four million barrels a year, committing the Security Council to further reductions if North Korea conducts another nuclear or ICBM test. 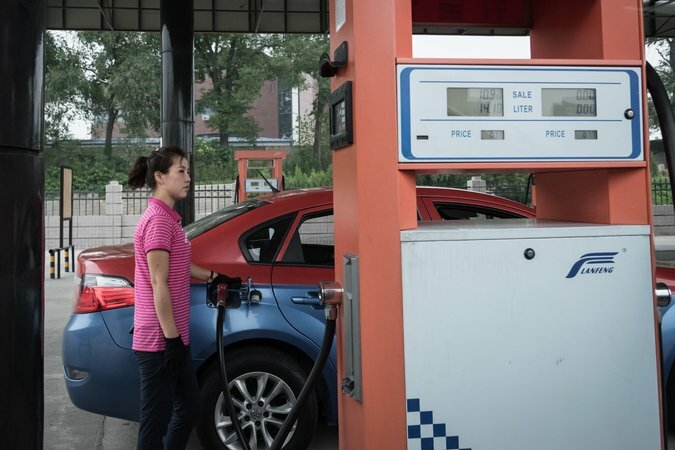 But the impact of sanctions depends largely on how faithfully they are enforced by China, which handles 90 percent of North Korea’s external trade, including nearly all of its oil imports, analysts say. If the reports of ship-to-ship oil transfers are true, it could mean that much more oil is flowing secretly into North Korea than allowed under United Nations sanctions, with or without the Chinese authorities’ knowledge. Mr. Trump has repeatedly urged President Xi Jinping to use China’s economic leverage to stop North Korea’s nuclear weapons programs. But analysts warn that Beijing is unlikely to push North Korea to the brink of collapse, still cherishing its neighbor as a buffer against the influence of the United States and its closest allies in the region, Japan and South Korea. In an interview with The New York Times published Thursday night, Mr. Trump explicitly said for the first time that he has “been soft” on China on trade in the hopes that its leaders will pressure North Korea to abandon its nuclear weapons program. He hinted that his patience may soon end, signaling his frustration with the reported oil shipments. 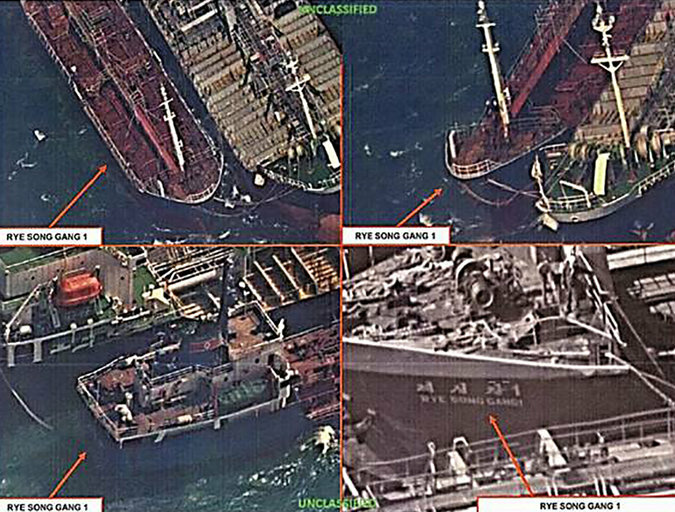 The United States Treasury Department said that these images show the transfer of refined petroleum between the Lighthouse Winmore and the North Korean ship Rye Song Gang 1 in October. When it blacklisted several Chinese trading companies and North Korean shipping companies and their vessels in November, the United States Treasury Department said that North Korea was “known to employ deceptive shipping practices, including ship-to-ship transfers,” a practice banned under a United Nations sanctions resolution adopted on Sept. 11. Mr. Trump’s criticism of China came after the South Korean newspaper Chosun Ilbo, quoting anonymous sources, reported that American spy satellites have spotted 30 ship-to-ship transfers of oil and other products since October in international waters between North Korea and China. The report said the “smuggling” took place between North Korean vessels and ships believed to be from China. Washington has called on the Security Council to blacklist 10 ships — including the Lighthouse Winmore — for circumventing sanctions by conducting ship-to-ship transfers of refined petroleum products to North Korean vessels or transporting North Korean coal, Reuters reported, citing United Nations documents. China and Russia subsequently asked for more time to consider the proposal, it said. The South Korean Foreign Ministry refused to confirm the Chosun report, saying that the matter was being discussed at the Security Council’s sanctions committee. But Chinese officials disputed the news media reports. Ms. Hua insisted that China has been “comprehensively, accurately, faithfully and strictly implementing” the United Nations sanctions. Ren Guoqiang, a spokesman for the Chinese Defense Ministry, was more categorical in denial: “The situation you have mentioned absolutely does not exist,” he told reporters on Thursday.